This former Threadneedle Street institution in the City of London was the headquarters of the South Sea Company. Incorporated in 1711, the company was assigned a monopoly on British trade with Spanish America but when that failed to result in riches, it embarked upon a speculative scheme which ended in the economic collapse known as the ‘South Sea Bubble’ and saw many investors ruined. Among those employed at the company as a clerk was essayist Charles Lamb who adopted his nom-de-plume, Elia, based on one of his fellow clerks. 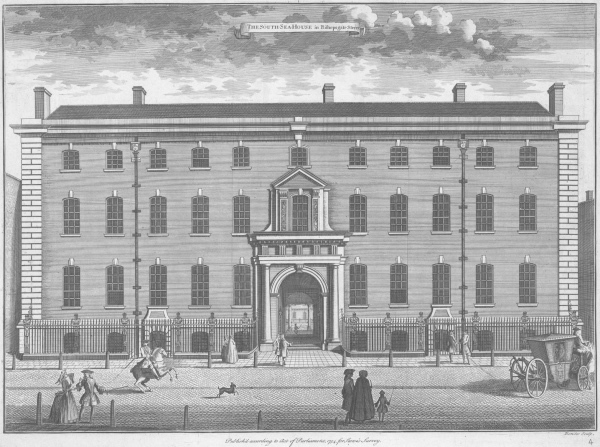 The building, located on the corner with Bishopsgate was designed around a quadrangle. The back of it apparently burned down in 1826 and was subsequently rebuilt. The building was partly remodelled in the 1850s and was eventually demolished at the end of the 19th century. Why was it pulled down? Surely some resourceful entrepreneur could have bought it for another purpose.